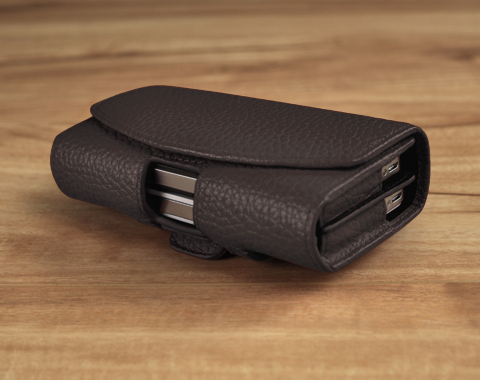 Genuine leather handcrafted leather holster case for storing two smartphones. One for work, and one for home, tailored made to order. Using the finest workmanship, our team of leather artisans beautifully tailor the case to accommodate for two devices base on the specifications you provide. Each case is tailored to fit. First, the fact that Story Leather recognizes that some must carry two cell phones was phenomenal. I was most excited when I found their website. I thought the price was fair before I received the product. When I received it, I thought they didn't charge enough. Elizabeth was great. She followed up with me on the order verifying the dimensions and providing me updates. She always answered the phone promptly. It's detail and quality are no less than the Coach products my wife purchases...for a lot more money! By my own fault, I wish i had got the clip with the belt loop. I am going to see if that can be remedied by Story Leather. The finished product is just *amazing*--beautiful, practical, well-made, sturdy. When ordering, the detailed questions and requests for measurements of the device indicated how precise they...the finished product blew me away. And the crafting is exceptional...astoundingly well-made & detailed. The dual carrier case has be very functional! WELL WORTH the order. Thanks! Leather holder for two Samsung S7 phones is great. Works perfectly. I designed a phone case to carry my two cell phones. I received the case within the estimated time and it came beautifully packaged. I am totally happy with the quality of the case and it is exactly what I wanted. This is a high quality "designer" looking product and I have had many people ask where I got it. This is the perfect case for carrying my personal phone and my work phone together. Excellent craftsmanship! Will definitely order another if I change size phone sizes in the future. 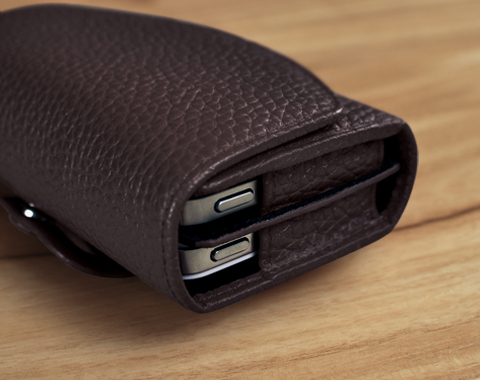 This is a very well made, functional phone wallet that is both attractive and appears to be durable. Time will tell on the latter, however I am very impressed with the workmanship and finish of this phone case. The magnetic "latch" holds very well and I really like the floating divider that goes between the phones. Well thought out and well executed. I am very pleased with the functionality, appearance and quality of this product. I would highly recommend Story Leather! I am very happy with the quality and the work menship. The double decker leather case is perfect for carrying my personal iPhone and my work iPhone - each with their own protective cases. There is plenty of room for both. They do not rub around the edges and pull free easily when I want to remove one of them - it is not tight. The main compartment separates the two sections by a leather piece that slides freely along the end caps so if I only am carrying one phone, I have a little spare room for keys, etc. I added the shoulder strap, wrist strap and zippered back. I carry the earbuds in the zippered compartment when needed to listen on a conference call for work. I never have to worry about having jacket pockets or pants pockets for my phones. This design is sleek, sophisticated and simple. The hidden magnetic closure on the flap works flawlessly. The high quality materials of leather and silver hardware and skilled craftsmanship of cuts, shapes and stitching are all excellent and beautiful. I will be ordering another for my career daughter. It was such a treat to be able to order a 100% customized leather case for two iPhones. I was thrilled to receive the case exactly as ordered and by the date promised. The call to confirm my custom specifications was a nice touch. The quality and craftsmanship shows in every aspect of the product from the leather, to the colors, to the construction. Plus, the aroma of the leather is almost as intoxicating as the supple feel of the leather in the hand. I have already received many compliments on the case from colleagues in conference rooms when I place it on the table. My lady has two businesses so she needs two phones. She bought a cheap plastic purse on Ebay that was too big and not made well to keep them together. I wanted something better and I found Story Leather. Both USA and local made. It took a while to fit because one of her phones was really old. But everything about the product was perfect. Now, her phones ate protected, in a smaller package, and the case matches her purse exactly. Well done! I ordered a phone case from storyleather.com. I have a work phone and a personal phone, so I needed a case which could accommodate both, primarily because I often go hiking and bicycling and carry a lot of stuff on my belt to begin with, so I don't have room for two phone belt clips. The case is very well made, and you also have the option of having your name put on it, which helps. 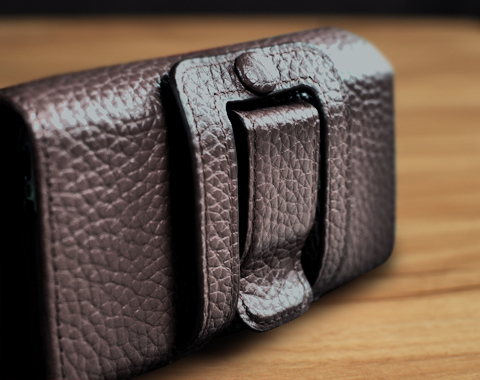 Your case is tailored to your specific phones, and your specific preferences; a double phone belt clip is just one of many options. The downside is that is takes well over a month to come in because it is custom made, and it is a little more on the expensive side. However, for my purposes, it was worth the price. I was so tired of lugging (and dropping) 2 phones everywhere I went, so my wife gave me your site and I found the Story Leather Double Decker product. I placed my order and a few days later, a customer service rep called me to confirm my choice in leather colors (I made a big mistake when I ordered, my fault) After the customer service rep helped me with my selections (I'm so happy they caught my error!) and my Double Decker arrived I was so impressed with the workmanship and quality of the leather! You can count me as a extremely happy customer and I'll be back for future purchases! My double decker case arrived earlier than promised and the quality was top notch. I have been using the product for the past several days and I am very satisfied. My husband needed a cell phone carrier for two phones. I had a custom Double Decker phone case made and he absolutely loves it. It's not something to put in your pocket buy he can easily carry his two phones from meeting to meeting. The quality is great. I love my double decker. I have never had to deal with two cell phones before, and it was driving me nuts trying to keep track of where each was, and be sure I had both with me. The case is not only useful, but it looks very professional and is beautifully made. Exactly what I envisioned. What more can I say? Thank you so much for the custom wallet belt for holding two phones. I could not find anything else like it anywhere on the internet. My husband could tell that it was a quality product. Previously, he was challenged keeping track of both phones even though he needed to have both on him. Your double decker phone wallet solved his problem. It is nice enough to wear with a suit also if he has to. It is hard to find a gift for him, especially since it must have "form & function." Your product went beyond that. Thanks again. I ordered the double decker for an employee goodbye gift. And she loved it completely. I matched the colors to her sorority and designed the case to her needs. Great way to say goodbye. I really enjoy my double decker case, my co-workers purchased this for me as a farewell gift and it was very thoughtful and useful. The craftsmanship is 100% and customer service was great. Only thing is the 20-30 days for your item. I understand it is custom but gesh! I had looked for something that could hold TWO iPhone 6+'s and no luck for over a year... I was googling one day and found this company. The price was fair for the quality. Put the order in and did the measurements. They called several times to make sure everything my numbers were right and get my exceptions. And the product was GREAT! I was in the market looking for a professional looking case to carry 2 of my phones (one for work one for personal use). I'm so happy I stumbled upon this website because although pricey, the quality is fantastic and worth the money. So glad I got it. I get so many compliments on it too. I found the Story Leather Double Decker phone case on a Google search. It is EXACTLY what we were looking for and at a reasonable price for the detail to make it. My husband was always trying to juggle 2 phones so this makes his life much easier. While you do have to wait 20-30 days to receive the final product, it is custom made and your phones fit nicely into the holder. Anthony even emailed me right after my purchase confirmation to be sure the measurements were correct. I had a couple of questions and he quickly replied giving me his best advice on what I wanted since you can't physically see the items like in a store. The product came in less than 30 days and they sent emails along the way on the progress. I will definitely use Story Leather again! My husband is very happy with the case. It is nice looking but simple. The magnetic closure is very strong so the phones don't fall out when he bends. We are well pleased with this first purchase! Thank you! As my phone got bigger over the years, it became harder and harder to find a holster to fit. I stumbled upon Story Leather while doing one of many searches for a quality, stylish case that fit my phone. The double case is an extra plus, though I use the extra slot for my wallet. The case's magnetic closure is awesome, and the belt clip is secure and convenient. Previous cases have either ripped at the clip or required threading through the belt. The sturdy construction of this clip seems to solve both issues, though truly only time will tell. If I have an issue with the case, it's my fault. My six inch phone requires a pretty bulky case, and size-wise, it rivals my wife's wallet. But under a jacket or loose shirt, it's not so bad. I have spent a small fortune buying less expensive phone cases for my two iphones, all of which fell apart over time. I finally decided to scour the internet for a durable leather phone case, which is how I found Story Leather. I have now had my beautiful double decker phone case longer than the other cheaper cases have lasted and it still looks great. As I pull my phones out numerous times per day, my fingernails scratch the interior leather lining. The scratches rub out quite easily by just rubbing my thumb over the scratches. The leather is very high quality. I store it in my handbag, which is a jungle of keys and pens. The double decker protects my phones unlike any other phone case I have had and the case still looks great. I selected the pebble grain exterior and smooth leather interior, with magnetized closure and pocket on the back where I store a few business cards. Be patient when you order because the customization takes about 2-3 weeks. It's well worth the wait. This is my third order of cell phone cases (guess I need to quit changing cell phones!). Every purchase has been exquisite. Even though I knew what to expect, when I first opened the box the packaging took my breath away. I always get lots of compliments. I'm very happy with the outcome of the process, and the quality of the product. Took a bit more time than I would have liked, and would have liked to have the engraving a bit larger, but there is no doubt about the quality in my mind. I have showed the product to a number of people who carry 2 phones, and they were all quite pleased with it. Time will tell how durable it is, because I am a very active person, and the product will come on and off my belt many times over the next year. Extremely please with my double decker phone case. The craftsmanship is stunning. Absolutely perfect for the two IPhones that I use and the magnetic strip and flap is not only designed correctly but fits like a glove. I could not be more pleased with my case. Thank you so much!! I need to carry 2 phones: a secure one for work, and a personal phone. Found StoryLeather on the web and gave it a try. I had a hard time getting the exact dimensions of my phones in their cases, and almost gave up trying to find the right info, but Nick from StoryLeather helped me get the info. The Double Decker case is beautiful, and a perfect fit for my 2 phones. It is very practical, well made and not at all as big or intrusive as you would think carrying 2 phones would be. I hardly notice I am wearing it. There is a divider to keep the 2 phones separated, and an opening at the bottom to push them out. Very happy with my purchase! I received the product today. I ordered the case that could hold 2 different phones as I carry two phones all the time - one for work (iphone 4) and other for personal (iphone 6). The case looked exactly as it appeared on the internet when I was browsing. The leather is top quality and it looks very elegant. Definitely met my expectations and would recommend it to my co-workers who are also looking for similar phone case. Thank you. I received my new double-decker a few weeks ago and I've been using it daily. The attention to detail and overall craftsmanship is extraordinary. The fit and finish is perfect. If you have the need to carry two cell phones, do not hesitate to order this product. Exceeded my expectations for sure. The double decker is perfect. It's rugged, functional, and looks good. It's the perfect solution to having to carry around two iPhones. Absolutely excellent t craftsmanship compounded with top notch materials should describe itself. The product I purchased is exemplary and have engaged me to purchase more products. Delivery is exactly as described, to the day, and even a follow up email. I would recommend only to my close friends! I am glad I found this company! I ordered a Double Decker to fit my iPhone 6 plus and a LG G3 which I had been carrying in my pocket without a case. 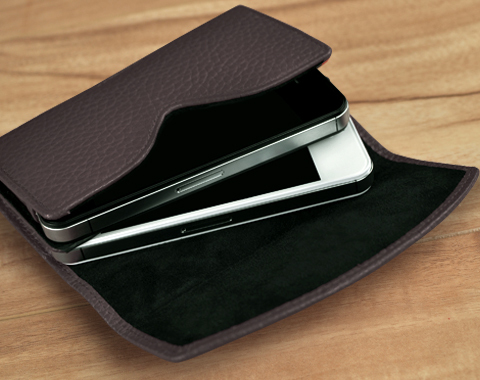 The case is made from a very nice beautiful pebble finished leather with a smooth leather interior. The craftsmanship is quite nice along with stitching and trim. My only downside to the case is the overall thickness which adds weight. The two phones plus the case feels like a brick, so I guess I have a safety device if someone attacks. Very nice product, and quality leather. Length is adjustable, which is perfect and fit for both phones is perfect. Well worth the money. This is my second case I ordered. I now have to carry two phones one for work one for home and story leather made one per my specifications. I love it. So pleased with my new phone case. So easy to find my phones in my bag now. Great service (even with a last minute change/request from me). Thank you so much!!! Just got my Double Decker wallet to house both my personal and my new business phones. Story took into account the cases I use, so the fit is perfect, and either phone jumps right into my hand when I need it. Fit and finish is much better than expected, and I was truly delighted with the presentation case it came in. The workmanship and functonality is superb. Customer service is responsive and intelligent. I will almost certainly be a repeat customer. Absolutely love the quality and craftsmanship--both phones fit perfectly. I especially enjoyed being able to custom design the case to my personal taste. I get compliments from everyone and have referred them all to your website. Great quality, great value, great concept! Thank you! Seems like great quality. I really hope it lasts! Exactly what I needed.. Review by Easy carry! I carry two phones; one for personal use and the other for work. Nice to keep them in one place. Top notch leather and top notch work. I am impressed and I love my Double Decker. Thank you Story Leather! I just received my Double Decker wallet for my work and personal iPhones. I couldn't be happier! It is perfect for what I need. Communication with Story was great and they wanted to make sure I was getting exactly what I asked for. Thank you for having the product for what I needed! The product is perfect, can support my 2 cell phone at the same time. My new case was worth the wait. Very well made. Perfect fit. High quality leather. I have already recommended StoryLeather to several of my friends! The double decker is amazing. Great quality and the customer service is at it's best. Truly one of a kind. Keep up the good work! Very high quality item - worth the money. Fits both phones perfectly. My husband loves it! Customer service was great, too. We gave this to our boss for a holiday gift. She has 2 iPhones and was always saying that she wished she could find a case for both. Great design and construction! I was concerned about spending so much for a case sight unseen, but I am very happy I took the leap. It had to be a large case to handle my Galaxy s4 with a Mophie case, as well as an iPhone so I wanted it to look professional. It does. I won't hesitate to come back to Story. They deliver a great product that would be very difficult to find anywhere else. My custom leather double iPhone case came exactly as ordered. Since I need two phones I thought of the most beautiful and efficient way to carry them. I receive compliments the second I received it!! Thank you! Well made and exactly as I asked for it to be designed. all excellent quality and perfect for my use. I am so happy with this iPhone case. It holds my two 4S iPhones and it will fit the new iPhone 5S when I switch over. I changed my order after my original submission and it was done as I wanted it. I was a difficult customer in that regards, but they were excellent! It took a while from when I ordered it until I got it, but it was well within the timeframe that they told me it would be. I just wanted it sooner... Communication was great. The shipping was excellent. It was packaged so that I could have given it as a high end gift! This case was not cheap, but I was lucky that I got what I paid for! High cost? This product was definitely a higher value! The only thing that would make this experience better if it was made in the USA! My 2 phone case is absolutely AWESOME! Before I got the case, I was juggling two phones and often dropping one or the other. After I got the case, I haven't dropped the phones once. It is a truly elegant way to carry a work phone and a personal phone. I show my 2 phone case to everyone and I have shared the link to your web site with most of them. Thank you for thinking of this and making it available! Well made. Looks great. A n exceptional solution to my problem of carrying two cell phones. I love the case. It does exactly what I wanted. Both of my phones are easy to get to. And I can put a credit card and ID I the zipper pocket. My only suggestion would be to increase the size of the zipper pocket a very small amount so the cards slide in easily. Well done exact to my specs and quality is A+! Will happily recommend to others and use again. Very well made, looks great, and holds my two phones perfectly. Nice attention to detail and well crafted. I use a Life Proof case for iphone and have a Blackberry for work so i needed something stylish that could hold both. And my custom case fits the bill. This is a great product. They were specific with their needs in terms of specifications and it is a quality product. I received a compliment on my first day using it to hold two iPhones. (I hated the fact that I needed one for work and one for personal use, but this makes it more managable and is a really nice way to carry them around.) It is professional, solid, quality and attractive. I carry both work and personal iPhones. That keeps work life separate from personal. With Mophie Juice Pak Air cases, they don't fit in traditional holsters. The DD case has a sliding divider which accommodates both cell phones. The cutout on bottom allows me to push up one or the other phone for use. The detail on stitching, the black ostrich finish of the leather, and the pop of purple inside color makes this case beautiful even though it is necessarily large. The large belt clip is snug and does not spin like the ratch locking clip. Thank you for a beautifully made and engineered case. Can you make them so that it opens like a book and I can see them display at the same time? Hi, yes, we are able to make a book style version to hold two phones, but this would require that both phones be of the same make/model (size), so that they can be closed and shut proportionally. it would look something like this shown that we call the Double Cartera Connect: http://www.storyleather.com/blog/2017/01/double-cartera-connect-a-book-style-case-made-to-hold-2-phone Please contact our support staff if you should be interested in something like this, but just a reminder, the phones need to be of the same make/model. Thank you! I have a Mophie battery pack case with my phone, will this case fit? Yes, for this particular style, we can make this case to fit any device as long as we have the proper dimensions. Please do note that we do charge an oversize fee when cases have dimensions greater than or equal to 6.69 in. / 17 cm. Please provide the exact model of your two devices, and also the precise dimensions either in centimeters or inches. We suggest the centimeters to ensure the precision of the measurements. PLEASE NOTE: This will make for a very large holster case. Yes, we can add an inner pocket big enough to fit 1-2 cards without interfering with the accessibility of the phone. Please request for an inner pocket to be sewn in as you go through the customization process. Can I make this to be a vertical case? Yes, we can make this case a vertically-oriented case, however, this makes for the phones to be harder to pull out and insert back in due to the length of the devices. More importantly, the 2 phones need to be of similar length, so that the smaller of the 2 phones are still accessible. Please request for this when customizing your order in the Special Request section.